Be grateful for filling up your own cup. The good news is that this type of short-term dehydration is typically pretty easy to fix. Whether you get a water bottle that reminds you to drink more or you pick up a stick pack of Liquid I.V.’s Hydration Multiplier, you can get your hydration levels back on track with pretty minimal effort. But what about dehydration in developing parts of the world? Unless you’re a serious athlete or severely sick, we don’t often think of dehydration as a super dangerous condition. That’s probably because chances are clean water is likely conveniently on tap and just a few paces away at any given point. But this isn’t the case everywhere. In developing countries dehydration becomes a much more serious issue, and is often a side effect of poor infrastructure. Think about it, if people aren’t getting enough water, it likely means nothing is getting enough water. Under these dire circumstances people are often forced to resort to drinking the same water they bathe and wash their clothes in, which in some cases has raw sewage flowing into it. The dirty water is severely contaminated with diseases and bacteria. These conditions are particularly grave in countries afflicted with natural disasters, which often leave a country wrought with malaria and other diarrheal diseases, leaving people deathly ill and severely dehydrated. With no tap to turn on or brightly lit CVS store to pick up a few liters of electrolyte drinks, the situation quickly becomes fatal. So what can we do to help combat this kind of dehydration? It is estimated that 1 in 9 people around the world do not have access to clean drinking water. And dehydration has taken the lives of 760,000 children in developing countries. So what can you, as a well-hydrated human do to help in the face of these staggering statistics? A lot, actually. For starters, you can work with organizations like The Water Project or sweat it out in races like Run for the Water. And you can patronize brands like Liquid I.V., who are helping do their part to end global dehydration. 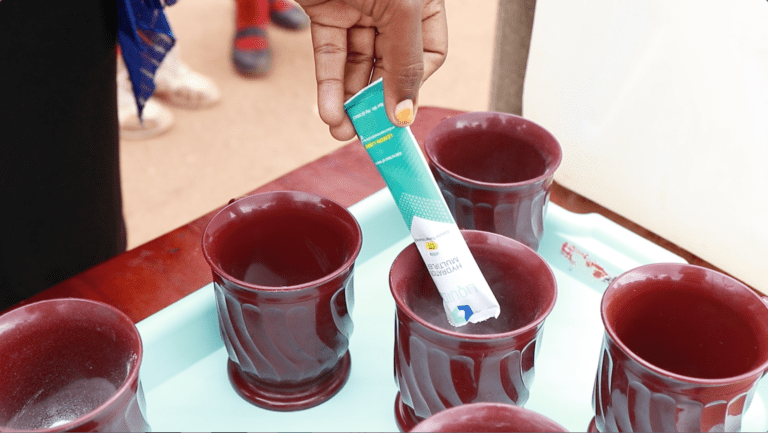 Defeating global dehydration is a tall order and the leading mission of Liquid I.V.’s give back program. For every purchase on Liquid I.V.’s website, a serving of their Hydration Multiplier, a non-GMO electrolyte drink mix, is donated to someone in need around the world. Liquid I.V. uses Cellular Transport Technology (CTT) to deliver a powerful antidote to dehydration. Liquid I.V.’s Hydration Multiplier uses “a precise ratio of electrolytes, glucose, and water, enabling the human body to absorb the proper hydration it needs to survive.” Drinking a single bottle of water mixed with Liquid I.V. is equivalent to drinking three bottles. This technology can be lifesaving to communities in need. Fill up your cup by giving back. As we turn on our faucets to take hot showers that last a little too long and water our succulents straight from the tap, it’s all too easy to forget how dehydration plagues many parts of the world. Whether it’s being mindful of your own water use and intake, being extraordinarily grateful for your tap water that sometimes tastes funny or donating to these countries, you can help. Remember, no effort is wasted—no matter how big or small. It all matters so, so much.